Repair stitches with ease! 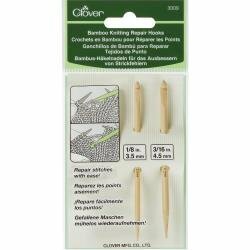 Smooth bamboo hooks that easily move through your project. Comes in 2 sizes for bulky and light weight yarns. This package contains two repair hooks: 1-1/8 inch (3-1/2 mm) and 3/16 inch (4-1/2 mm).